It’s hardly surprising that, as we approach and enter retirement, we take a more active interest in retirement incomes and how they are generated. Interest rates are too low to preserve the value of savings against inflation let alone do that while generating an income stream that will support any reasonable lifestyle. Hence superannuation and other savings, or at least some substantial proportion, are likely to be invested where there is reasonable expectation of a greater return with associated increased risk and a degree of nervousness about markets and other influences. Changes to the rules that affect what we hope are suitable arrangements are likely to be viewed unfavourably. In that context, Bill Shorten’s announcement about a change to ALP policy around dividend imputation credits provoked a furore followed by some backpedalling to promise compensation for pensioners caught in the net. Many Australians with relatively modest savings have packets of shares acquired with encouragement from government when enterprises like Telstra were privatised. Although the value of Telstra shares have fallen they do pay attractive franked dividends and it seems unreasonable that some investors should have a benefit unavailable to others simply because their incomes are sufficient to be taxable. In my view this ALP policy proposal about imputation credits is entirely discreditable. Like so much that passes for policy in the current political climate this proposal from the ALP is no more than fiddling around the edges and unlikely to be successful for long if at all. Superannuation funds, self managed or otherwise, and big investors are unlikely to sit quietly and lose any significant benefit. They will do their sums, take advice, and change investment strategies accordingly. Only small investors without access to relevant advice or alternatives will be caught and at least some of those will be exempted by whatever provisions are made to avoid making more people eligible for the pension by virtue of reducing their assessed incomes. The real issue is not that some people with little or no taxable income may receive a refund from franked dividends. It is that retirees can have very substantial incomes that are not liable for taxation. All income from any source should be assessed for taxation on the same basis. That is not likely to be a complete solution to what ails the national economy but it would be a sensible step toward a solution. According to the Association of Superannuation Funds of Australia (ASFA) retirement standard, a comfortable retirement lifestyle in 2017/18 can be funded by $44011 pa for a single or $60457 pa for a couple. Only a couple of years ago the LNP government changed superannuation rules so that the maximum amount that can be rolled into a superannuation income account on retirement is $1.6 million. If that amount is drawn down at the minimum rate required by government (5% pa), it will yield $80000 pa which is non-taxable. A couple who each managed to achieve the maximum allowable income accounts would be able to draw $160000 pa free of tax. Those amounts are substantially more than those suggested by the ASFA as sufficient for a comfortable retirement and it is possible that they could be increased by part time work or earnings from other investment with some way to go before reaching a taxable threshold. Although I might be personally happy to be able to draw more than enough for a comfortable retirement free of tax, as a citizen I can see how, as the proportion of people in retirement increases, that might not be sustainable for the nation. Reversing the decision of a former government to make superannuation pensions non-taxable would require real political courage but it is difficult to see any rational alternative. All retirement income above some reasonable threshold, perhaps the ASFA standard for a comfortable retirement lifestyle, should be taxable with progressive rates. That would surely go a long way toward solving the revenue problem while still allowing retirees who have been able to accumulate savings to enjoy the benefits in a better than comfortable lifestyle. 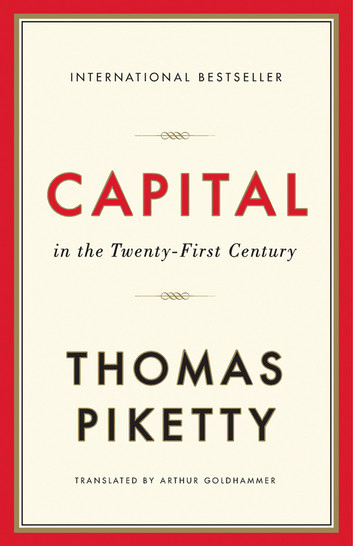 As it happens, my reading over recent weeks has been Thomas Piketty’s Capital in the Twenty-First Century. At almost 600 pages of dense text plus extensive notes it is not light reading, especially for somebody without prior background in economics. It is fascinating reading and highly relevant to the discussion of national economic policy but those with limited time might prefer the four paragraph summary offered by the Economist. Piketty and colleagues have pulled together historical economic data stretching back to the French Revolution (1789). He demonstrates that over most of that period wealth and income have been unevenly distributed. The top 10%, and especially the top 1%, have had wealth and income 25 times or more the average and the bottom 40% have had essentially no wealth and barely enough income to survive. The period of exception was the late 1940s to 1970s following the disruption of the World Wars that destroyed much capital. That period of reconstruction was one of uncharacteristically high growth that allowed more equal distribution of capital and income. In recent decades growth has slowed and Piketty expects that to continue due to the combination of reduced demographic growth and economic factors related to productivity. Under those conditions his predictions are for increasing inequality. The rate of return on capital (typically 5% over the long run) is greater than the expected long run rate of growth in the economy (1% to 2%). That difference will enable saving, especially by those with larger amounts of capital who can typically obtain better than average returns, thereby increasing the volume of stored capital and concentrating it in fewer hands. A further consequence is a lesser share of income for labour adding to the inequality. Revolutions, in France and elsewhere, have been driven by such inequality reaching levels that could no longer be tolerated by the majority. That seems to be an inevitable consequence unless steps are taken to address the problem. Piketty favours progressive taxation of both income and capital to redress the imbalance. Shorten’s proposal for imputation credits is a feeble attempt to move in that direction but, in my view, it is misguided and insufficient. The looming challenge of inequality is massive and will not be solved by tinkering at the edges.